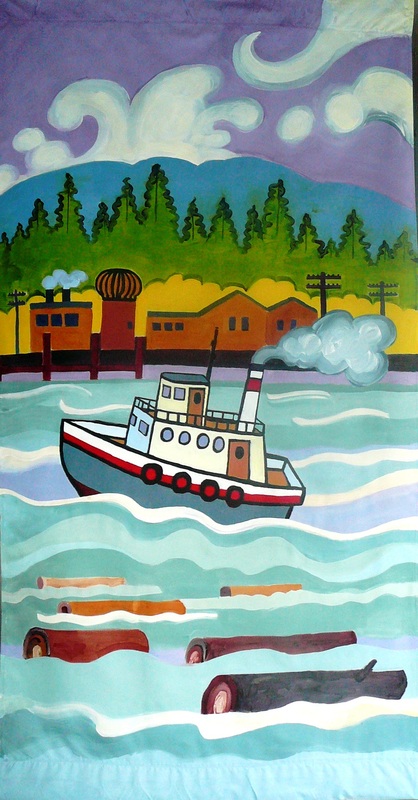 A companion piece to the Fraser Mills town banner, the view is of the Canadian Western Lumber Company and the hills of Coquitlam as seen from the river. The waterways were vital to the early settlement of Coquitlam and the tug boat was an important part of rounding up the logs to bring to the mill. I’m especially pleased that this design which was created through community dialogue and with the help of a sketch of a participant at the first banner event.